We first came across Oaks back in April when Mark went along to a promo event for Taste of Nottingham to introduce a number of restaurants within Nottingham city centre. He's been raving about their Quail Scotch Eggs ever since so what better way to catch up after a hectic Christmas and see just what he was raving about. Interior wise it's certainly my kind of restaurant. With reclaimed wood panelling softening the walls whilst adding character the seating all appears to match following the clean lines I like to see. Too often we're seeing a mix-match set-up and a credit to the interior designers for sticking to one concept and following it through. We've seen a good number of new start ups in Nottingham recently which have been part of restaurant chains following set patterns within their brands. Oaks is much different and unique in that manner. Food is cooked over wood embers sourced locally via the Nottinghamshire Wildlife Trust whilst much of the food and drink is locally sourced including ales from the nearby Castle Rock brewery. We have a fantastic array of producers in the area and Oaks should be applauded for championing local produced including their hearty sausages which come from Tuxford's Butchers over in Netherfield. For starters we had to go for Mark's revered Quail Scotch Eggs (£4.00), Baked Lincolnshire Cheese with Sourdough Toast (£4.95) and a serving of Pork Crackling (£4.95). The quail eggs came out looking beautiful with a soft yolk. In honesty I had expected a little more for the money as we were only served the equivalent to two of these tiny eggs. They were however delightful to taste with a fantastic meaty exterior. The beef tasted amazing and they had a wonderful crumb exterior. It's easy to see why they were nominated for an award at the Scotch Egg Challenge 2015 as they are something special- despite only being a small serving. My personal choice off the starters menu was the Lincolnshire Poacher Cheese with Sourdough Toast. The sourdough toast was lovely. Lightly char grilled and delicately flavoured from the sour dough. This came with a large sized dish of baked Lincolnshire Poacher cheese. On arrival the dish looked a show stopped- the kind of thing for which there will always be someone in a party that says "I wish I ordered that now!". Whilst the sourdough toast was beautiful we had our reservations over the choice of the Lincolnshire Poacher cheese. It simply lacks any oomph. We love our cheeses but tend to like it like our wines- with a bit more body. We'd love to see the dish with something like an Extra Mature Farmhouse Cheddar which would give the dish a little more bite. 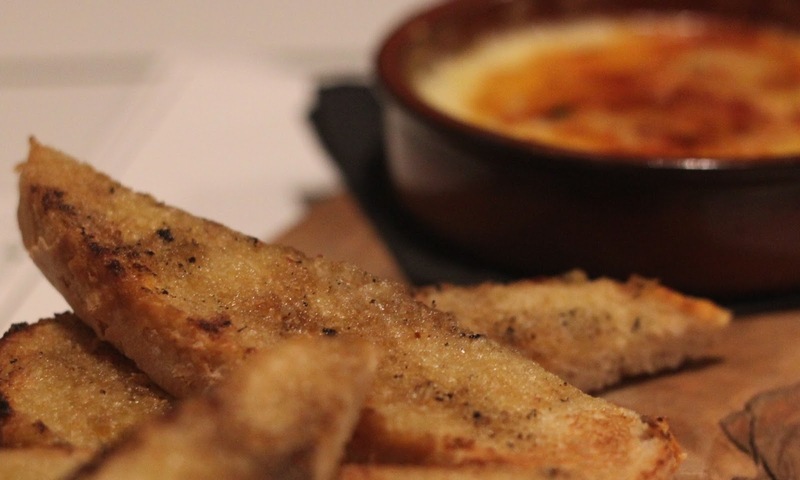 We have been reliably informed that the cheese choice for this dish does change regularly and in January Oaks will be using a Stilton cheese instead. Still relatively local produce. For our main meals we opted for the sharing platter (£37) comprising one sausage, half a chicken and either a tuna steak or 10 oz Porterhouse steak. We hoped this would more than satisfy our healthy appetites with the choice coming with a choice of two sides from the menu. For our main meals we opted for the sharing platter. With a Pork, Pancetta and Smoked Paprika sausage which must have been around 8-10 inches in length and of a decent girth too. With the subtle pepper of the paprika working well with the smokey pancetta the sausage would have worked well on its own in a bun (That is an option on the menu). For our half a chicken we opted for the Paprika Chilli and Garlic. The piece was of a good size compared to other restaurants we've been to and cooked beautifully. It's very easy to dry-out chicken but ours was moist, tender and well cooked. The flavours were on the subtle side which suited Mark as he's not usually someone to appreciate exceptionally hot and spicy foods. The flavours were very delicate whilst fusing with the lightly char grilled skin. A very nice piece of chicken. Our 10 oz Porterhouse Steak came out looking lovely whilst laced from the grill, We'd asked for it rare and we got rare as expected. With a nicely char grilled woody taste it was beautiful. Sides wise we'd opted for the hand cut chips, truffle mash and an extra portion of coleslaw for mark. The truffle mash was creamy, fluffy and a very nice accompaniment to any of the meat dishes on our table. The truffle was in the form of very fine shavings which added a delicate flavour to the mash- a bit on the steep side if you're buying it as part of your meal at £3.95 however. The Hand Cut Chips (£2.50 on regular menu) were nice and fluffy with a moderately crispy exterior so well worth trying and the naked coleslaw (£2.50 on main menu) was more of a slaw than the stuff you see in the supermarket with a nice array of finely sliced veg in a balsamic glaze instead of thick sauce. The price was perfectly reasonable for the chips and coleslaw although I do feel that the truffle mash whilst very nice was a little pricey if you're buying it as an outright item. The sharing platter initially seemed relatively good value for £37 however doing the maths based on what we ate it only really saved us a few quid.. I'm not sure I'd happily pay the individual prices for the items. With half a chicken costing £12 before you even consider adding a side it does make a regular meal at Oaks, Nottingham rather pricey and takes it into the 'treat' territory for many. The food was great, however. We washed our food down with a pint each. Mark opted for Castle Rock's Harvest Pale (£3.75 a pint) and I went for a darker ale in the form of Red Riding Hood (£3.90 a pint) which had a nice nutty taste which worked well with steak. Would we go back- I think we would yes although it would likely be for a treat at some point. At Oaks' prices I think we'd honestly consider it for special occasions only or if they had a really good special offer on. The food was lovely, beautifully cooked but we thought a little more than a shade overpriced in places which put it beyond regular returns. As a champion of local produce we commend what Oaks is trying to achieve and wish them every success for the future. The Sleek Interior at Oaks Nottingham.